The Newspaper theme comes with 12 footer styles. You can now customize the footer by adding text, widgets or social icons, and maximize your website’s impact on the audience. The footer uses the widget area to display information. 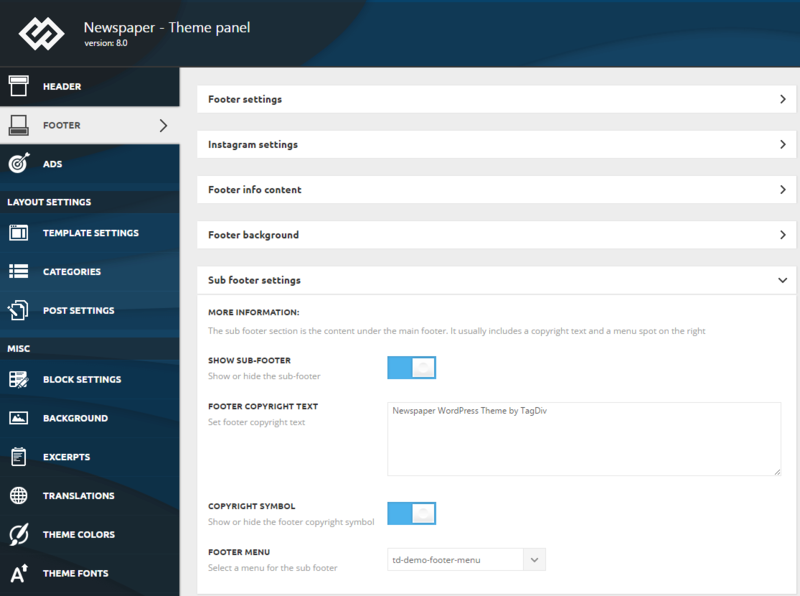 Step 1 – Navigate to Newspaper > Theme panel > Footer > Footer settings panel to access the footer options. You will see 3 sections. Step 2 – Expand the Footer Settings section and select a Footer template. All options will automatically load based on your selection. 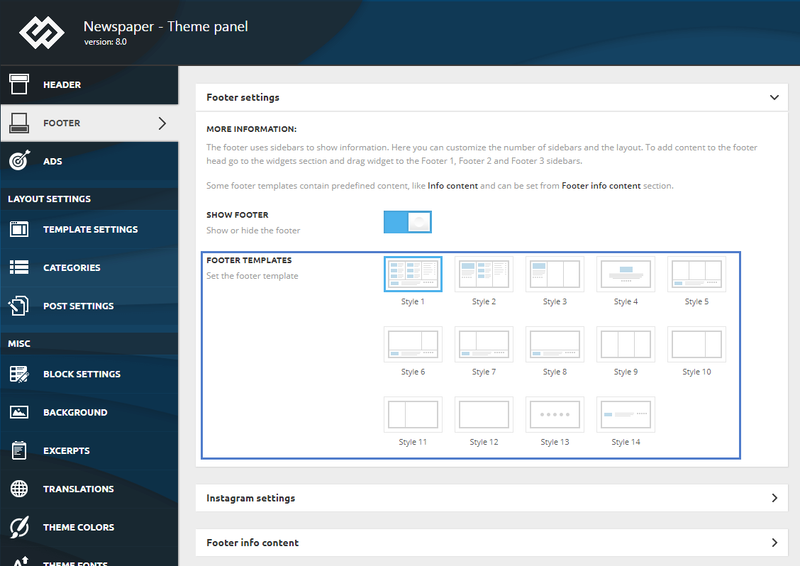 Some footer templates contain predefined content like the Footer info content that can be set from its section located in Theme Panel. 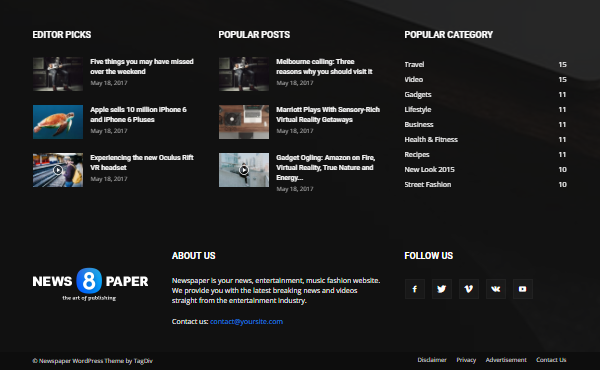 To add this type of content go to the Theme panel > Footer > Footer Settings > Footer Templates and choose the desired style. 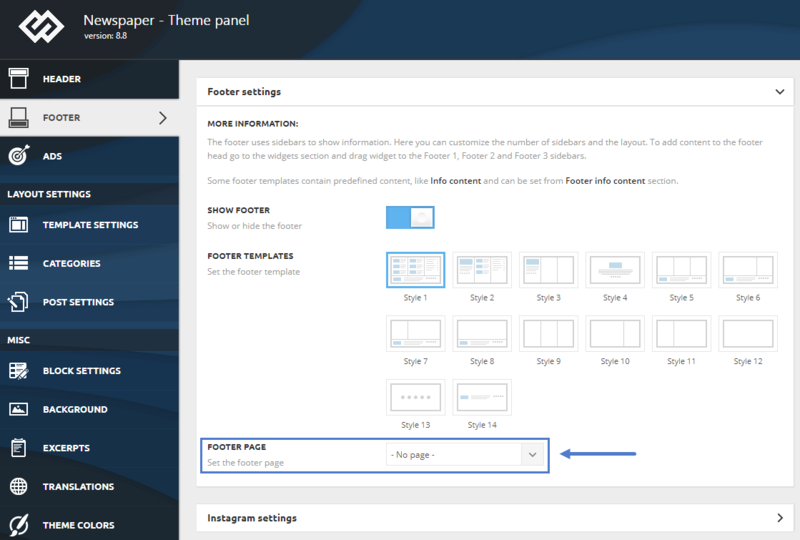 To customize the content from Info content you need to go to Theme panel > Footer > Footer Info content section and add your desired information. Step 2 – Here you will find 3 sidebars: Footer 1, Footer 2 and Footer 3. Step 3 – Drag the widgets you like in each Footer sidebar. Note: Style 1 to Style 5 are designed to populate the footer with predefined content. If you decide to add custom content it will be added after the predefined content. As you already noticed, this set of options is quite important in the construction of your footer. Go to Newspaper > Theme Panel > Footer and expand the Footer Info Content section to begin customizing this area. In this section, you can add a footer logo, a retina logo, and a descriptive text. 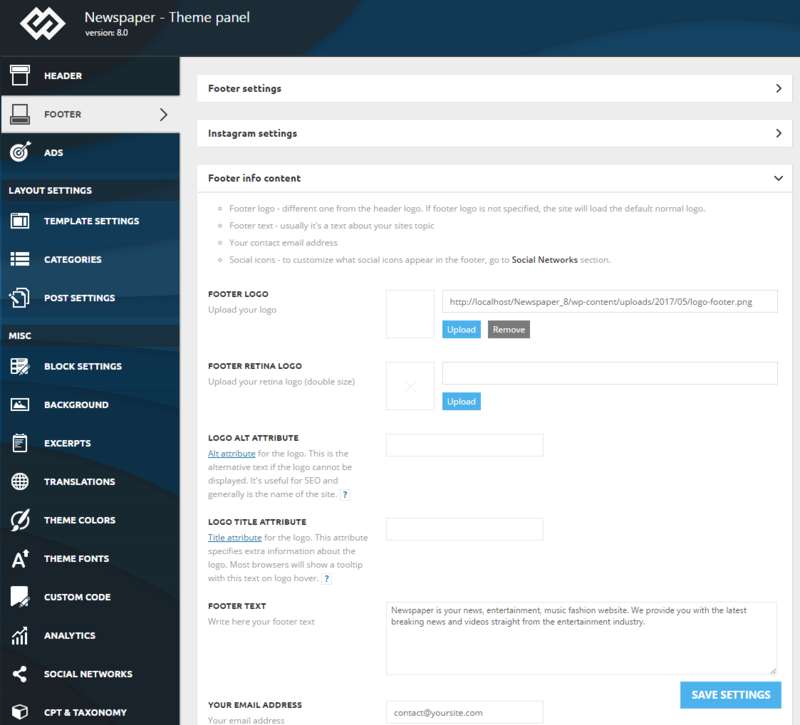 You can also set up your email address and you can decide if your footer will display the Social Icons. 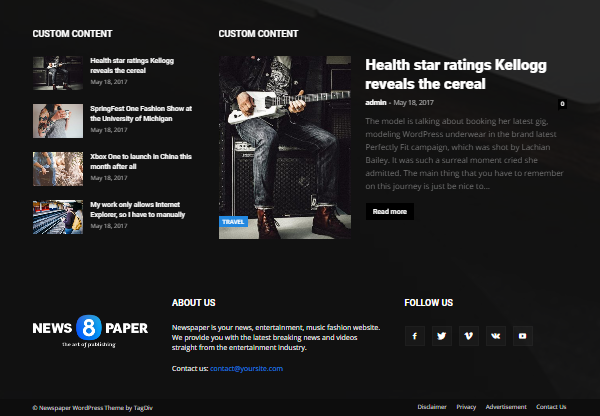 In Newspaper> Theme panel > Footer > Footer Settings, you can choose the style for your footer. 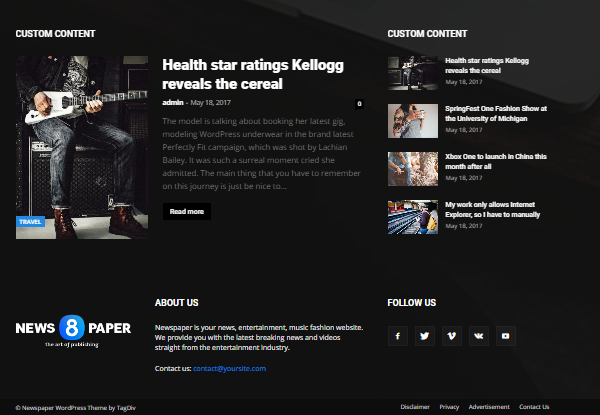 You have 12 different templates combining the custom and the predefined content to make your footer look amazing. This style has 4 sections. It displays content from the info content on the fourth widget area and automatically populates the other three areas with predefined content. This style has 3 sections. It uses the predefined content from the info content section on the first widget area, and automatically populate the other two areas with predefined content. This style has 3 sections. It uses the predefined content from the info content section on the first widget area and gives you the freedom to decide how to populate the other two widget areas. This style has only one section that uses the predefined content from the info content. This style has 4 sections structured on three columns and the info content section. It’s up to you to decide what content will be displayed in these widget columns. This style has 3 sections. It uses the predefined content for the info content section, while Footer 1 is stretched on two columns. It’s up to you to decide what content will be displayed in these widget columns. This style has 3 sections. The Footer 1 area is using a column while Footer 2 is stretched on two columns. Style 7 uses the predefined content from the info content section. This style has 2 sections. The first is stretched on three columns (Footer 1) while it uses the predefined content from the info content section. This style has 3 sections. It’s up to you to decide what content will be displayed in these widget columns. This style has 2 sections. The Footer 1 stretched on two columns. It’s up to you to decide what content will be displayed in these widget columns. This style has 2 sections. The Footer 2 stretched on two columns. It’s up to you to decide what content will be displayed in these widget columns. This style has only one section stretched on three columns. Use this to create a special custom footer. This style ads the social icons underneath the one column section. It is up to the user to decide the content added to the top section. 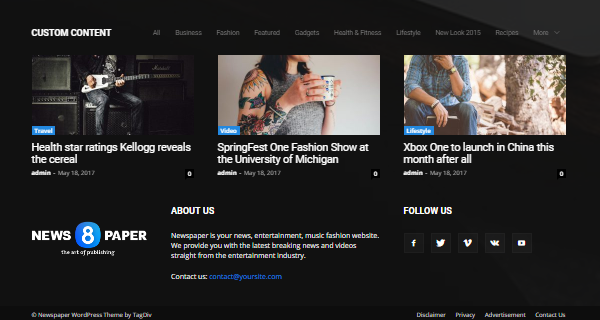 Last but not least, this style adds 3 columns with the logo, footer info, and social icons. Perfect for a minimalist look and feel of your site. You can create a page in the tagDiv composer with the layout and elements you want to show in the footer and then select it as your footer page. 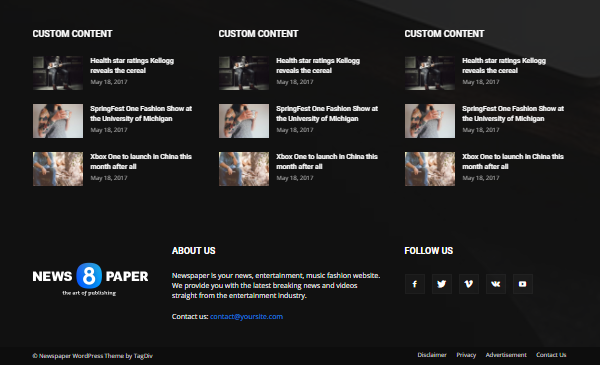 This will override the footer template and show your custom designed page instead. The sub-footer section usually includes a copyright text and a menu that is positioned on the right. Go to Newspaper > Theme Panel > Footer and expand the Subfooter settings section. In this panel, you can assign a copyright text very easily and you can choose to display the copyright symbol. The most important option in this section is the Footer Menu. You can assign a menu to your sub-footer.